Proper grounding of electrical systems is essential to the safety and performance. Article 250 of the 2014 National Electrical Code covers grounding and bonding requirements in great detail. Part III of Article 250 provides rules for the grounding electrode system and grounding electrode conductors. The image above shows several code violations of this section of the code. The most obvious problem shown in this picture is the violation of section 250.64(A). In this section the code reads: “Bare aluminum or copper-clad aluminum grounding conductors shall not be used where in direct contact with masonry or the earth or where subject to corrosive conditions. Where used outside, aluminum or copper-clad aluminum grounding conductors shall not be terminated within 18 inches of the earth. In the referenced example, the installer used a 4 AWG aluminum conductor as a grounding electrode conductor and terminated at the ground rod outside within 18 inches of the earth. The proper method of connecting to this rod would be to use a properly sized copper conductor in accordance with section 250.66 of the N.E.C. One other less obvious code violation is found in 250.53(G). This portion of the code states that rod electrodes shall be installed such that at least 8 feet of length is in contact with the soil. Assuming that this is ground rod is 8 feet in length, the entire length of the rod must be in contact with the soil. As you can see, a portion of this rod is above grade and some is in contact with gravel. A proper installation would be to drive the entire length of the rod below grade level. Some electricians and even inspectors would then refer to 250.68, which states that the code requires all connections to grounding electrodes to be accessible. 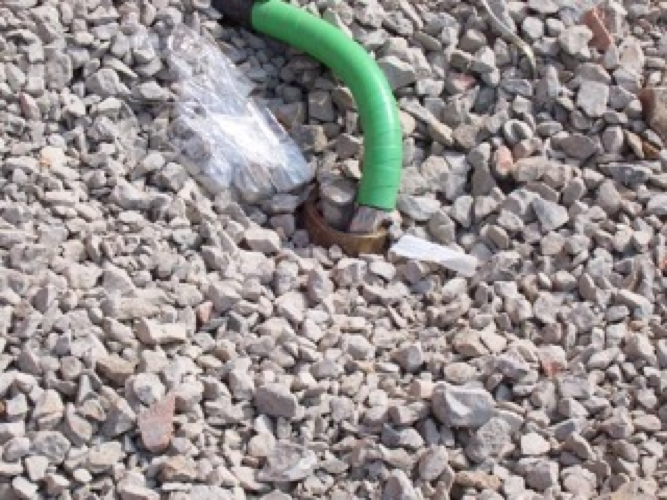 Exception number 1 to 250.68(A) allows an encased or buried connection to a concrete-encased, driven, or buried grounding electrode to not be accessible. It is not only allowed but it is required to drive an 8 foot long ground rod entirely into the ground. Grounding and bonding are among the most discussed topics among electricians. Check in to classes4contractors.com often to read about common code violations and hopefully learn a few tricks of the trade. Classes4contractors.com offers exam preparation for electricians, electrical practice questions, electrical practice exams, electrical continuing education, and is a great resource for information about electrical exams. We have helped thousands of students pass the difficult state electrical exams and obtain their license. We even offer live exam preparation seminars and continuing education courses. Look around the site and please email any suggestions to contact@classes4contractors.com. Send us a picture of a code violation or any other interesting picture with an electrical subject matter and if we use it in an article, we will send you a great prize. Why not just always drive a 10′ ground rod? Great question Benjamin. Even if you drive a 10 ft. ground rod, the NEC requires the upper end of the electrode to be flush with or below ground level unless the above ground end and the grounding electrode conductor attachment are protected from physical damage. You could certainly drive a 10 ft. rod and leave a portion of it above ground if you provide the required protection. This can be easily accomplished by using a small handhole enclosure or other type of inspection well. The most common type (and cheapest) ground rod used in residential and small commercial applications is only 8 ft. in length and the code requires those rods to be driven flush with the ground as specified in 250.53(G). Grounding is probably over lookedbyI many in the trade especially with your first and second year apprentice and others as well.. grounding is essential so that any motor or machine to preform as it is intended for. Why not use a ground well. The clamp is installed incorrectly. .The pipe is not properly hooked up.